Liam McGourty is your average 10-year-old boy in many ways. He loves Legos. He loves the Boston Red Sox. And his favorite color is green. Liam meets Fenway for the very first time. Duchenne muscular dystrophy (DMD) is characterized by degenerative muscle weakness. There is no known cure. “It is 100 percent fatal,” Kristen McGourty told the Metrowest Daily News. Her son Liam, now 10, was diagnosed with DMD in 2010. They live in Norwood, MA. The disease affects mostly boys and the life expectancy typically does not extend beyond the teenage years, Kristen said. Due to DMD, Liam is small, but he is a giant on the inside. And very much a regular boy. He is an “old soul,” his mom told the media outlet. He loves animals, super heroes, Legos and the Boston Red Sox. And his favorite color is green. Living each day as it comes. Helping Liam and other boys with DMD Experience life to its fullest. In early adolescence, people with DMD lose their ability to walk. 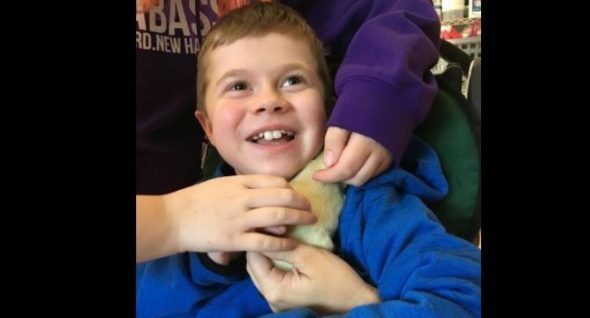 For Liam, this happened last December and he was confined to a motorized wheelchair that the family (because of Liam’s favorite team) calls “The Green Monster.” Liam, a 4th grader, uses it to get around school. The McGourtys live in a two-family house — in the upstairs unit. His parents have to carry him up. They hope to one day be able to move to a place that better suits their needs. They are well known in their town for their work with Liam’s L.E.E.P. and in their efforts to cram a lifetime of experience into the years Liam has, they’re always out and about. Liam has met members of the Red Sox, run the bases at Fenway Park and watched more than 40 games there. When Pauline Hoegler, founder of of Golden Opportunities for Independence (GOFI), heard Liam’s story, she reached out to the family. Hoegler raises and trains golden retrievers to work as service dogs. She invited the McGourtys to participate in a program that teaches children how to behave around the dogs. Liam loved them all. Liam told Hoegler how much he loved the Red Sox. And that his favorite color was green. Fenway with his brothers and sisters. The green staining is caused by exposure to biliverdin—a green bile pigment found in the placenta. It is harmless and temporary. Meanwhile, the McGourtys applied to receive a service dog, recognizing all the benefits — physical and emotional — the animal would afford Liam. They were placed on a wait list and stayed there for a year. In August, though, GOFI’s 4-year-old Bridget delivered a litter of 10 puppies, one of which, Hoegler immediately noticed, seemed meant for a very special boy. “He was green,” Hoegler said. 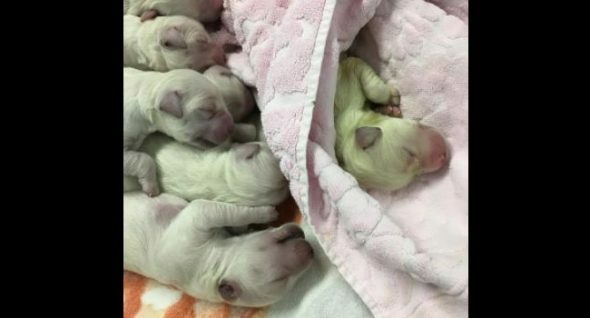 Hoegler has been breeding goldens for two decades but has never seen the rare phenomenon herself, which occurs when bile leaks from the placenta into the amniotic sac of the puppy. She called the McGourtys, and they came the meet the puppy they’d planned on calling Fenway from the outset. Now the name seems to make extra sense. The green is only temporary. Fenway will look a typical golden retriever before long, but his temporarily stained fur seemed like serendipity to everyone. “It was fate,” Hoegler said. On Saturday, Oct. 21, Liam’s L.E.E.P is hosting the 8th annual “Miles for Liam” 5K and walk/run. To make a donation that will be placed into a trust to help the McCourty family, checks can be made out to “Liam McGourty” and mailed to 55 Cedar St., Norwood, MA 02062. To learn more about GOFI, visit their website or Facebook page. Tags: Duchenne muscular dystrophy, Golden Opportunities for Independence, golden retrievers, green puppy, Liam's L.E.E.P.